A Natural History of Dragons by Marie Brennan is the first in a series of five books chronicling the past adventures of the famous dragon naturalist Isabella, Lady Trent. This book begins with her early life—a little about her childhood, her early interest in dragons, and eventually her marriage—and then proceeds to focus on her first important adventure involving the study of dragons. The second Memoir by Lady Trent, The Tropic of Serpents, was released in the US earlier this year and will be released in the UK on June 20. Even as a child, Isabella had an “unladylike” interest in the subject of natural history, particularly when applied to dragons. Her curiosity about such matters led her to many actions of which her mother would disapprove: preserving and collecting dead sparklings, dissecting an expired bird to learn how its wings work, reading Sir Richard Edgeworth’s renowned reference A Natural History of Dragons, and dressing as a boy in order to sneak into a party of men hunting a wolf-drake. The latter incident resulted in her injury, and after that she attempted to fit her mother’s idea of a proper lady for a couple of years by spending her time horseback riding and sketching. While Isabella later learned to appreciate some of the skills she learned during this time, she found the years during which she abandoned her interests dreadfully dull. Marriage was inevitable for a young woman from Scirland, and once Isabella reached sixteen years of age, her mother turned her attentions toward seeing her daughter wed a fine gentlemen. In hopes that it may help her secure some happiness for herself, her father provided her with a list of eligible scholarly gentlemen likely to have well-stocked libraries, including some who owned A Natural History of Dragons. When Isabella later toured a menagerie with her brother, she made the acquaintance of one of these gentlemen, Mr. Camherst, in the dragon room. The two conversed about dragons and met again after that at various social engagements, and eventually Mr. Camherst proposed to her, intrigued that she seemed to be interested in him for his hobby rather than his wealth. Isabella agreed, but only after embarrassing herself by making it clear she was primarily interested in his library (which did not deter Mr. Camherst, who found this more amusing than insulting). Isabella and Jacob Camherst married, and while Isabella enjoyed the library, she found her wifely social duties rather dull. Eventually, she resumed studying sparklings and met Lord Hilford, who has traveled all over the world studying and even capturing dragons. After learning of his upcoming expedition to study rock-wyrms in Vystrana, Isabella determined to convince Jacob to go on this trip. She persuaded him to do so, but she soon discovered that living vicariously through his adventures is not enough for her, nor is studying the little sparklings at home. Isabella decided that she herself must accompany this expedition and managed to persuade both her husband and Lord Hilford to allow her to come. When the expedition arrives in Vystrana, they are attacked by a rock-wyrm before they even reach their lodgings and they quickly learn their work will be even more difficult than expected—the rock-wyrms have recently begun attacking people and no one knows the reason for this sudden change in their behavior. A Natural History of Dragons sounded like a book I would enjoy based on its premise: memoirs written by a woman who defied the social conventions of her time to become a dragon naturalist famed for great discoveries in her field. It was indeed a book I enjoyed very much, but what truly made this book a gem was Lady Trent herself. She’s a fascinating character as one who overcame many obstacles in order to pursue her dreams, and she also has a compelling narrative voice that makes her story a delight to read. As she reflects back on her early life, she does so with straightforward honesty and a sharp wit. 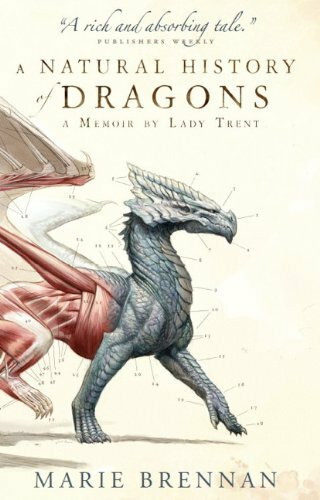 I loved her storytelling style and the personality that came through the pages, and I thought the inclusion of some of Isabella’s sketches added to the charm of A Natural History of Dragons. The plot itself is not particularly extraordinary. It’s largely an account of Isabella’s early life that eventually turns its primary focus to her expedition to Vystrana and the mystery of the recent changes in rock-wyrm behavior. There is much time spent on her studies and interactions with the local people, and there’s a little bit of a love story since Jacob and Isabella do come to care for each other (not that they weren’t fond of each other before they were married, but they did seem to get married more because society expected it than because they wanted to). Without Isabella’s character and narrative, this book would not have been particularly memorable, but she made it special. I loved that Isabella is a character motivated by an insatiable curiosity that drove her to keep learning despite the constant reminders that women were not supposed to behave as she did or find the study of natural history worthwhile. Most of all I loved her courage—not so much her ability to face dragons since these actions often seemed reckless more than brave, but the courage it took for her to follow her dreams knowing that she’d be judged as foolish and improper. At first, she does attempt to fit into the mold expected for a young lady by quietly sketching and remaining quiet about her enthusiasm and knowledge about dragons, but she slowly begins to follow her own path instead of society’s and has adventures and makes remarkable discoveries. If there is one thing I wanted more of from this book, it was to be more emotionally invested in what happened. There certainly were some emotional moments, but there was a certain distance that kept me from getting too attached. This is perfectly fitting for this book since it is supposed to be a memoir about Isabella’s career as a dragon naturalist, not her most intimate feelings and secrets. However, it did keep me from wholeheartedly loving this novel with no reservations even though I thought a great deal of it. A Natural History of Dragons is not a book that stands out for its plot, but it has a memorable main character with an engaging narrative voice. I’m looking forward to reading more of Lady Trent’s adventures and finding out what happened in the next stage of Isabella’s life, as I found the first volume of her memoirs utterly charming. Where I got my reading copy: Finished copy from the publisher of the UK edition.